Several weeks ago, John Marsh, Russell Beck, and I discussed on the Fairly Competing podcast the special problems that arise when companies pursue so-called "whistleblowers" for trade secrets misappropriation. 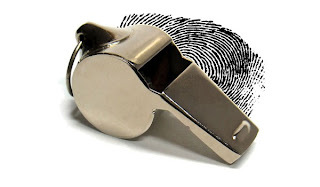 As John wrote on his blog this Spring, such suits may have the unintended consequence of giving the whistleblower a public forum to air her grievances and enable her to draw attention to facts that are potentially embarassing or harmful to the company. One of the issues that can arise concerns the whistleblower's claim that her activity is protected under the First Amendment. Many states, including California and Illinois, have anti-SLAPP statutes that enable parties who face frivolous strike suits to pursue an early, special motion to dismiss. (SLAPP is an acronym for "strategic lawsuit against public participation."). This procedure generally allows for: (1) consideration of matters outside the pleadings themselves; (2) a stay of discovery; and (3) mandatory cost- and fee-shifting. Traditionally, SLAPP suits (and anti-SLAPP) motions arise from defamation claims brought against a group of citizens, or notable citizens who have spoken out on a public issue. But they can arise from claims of trade secrets theft, because disgruntled employees often feel as though the public has a right to know of certain non-public information concerning a company's business practices, services, or products. In our episode of Fairly Competing, John, Russell, and I discussed a particularly interesting suit in California in which James Clark accused Anheuser-Busch (his ex-employer) of filing a SLAPP suit. According to Clark, A-B sued him after he participated in (really, initiated) a class action related to the A-B's supposed mislabeling of alcohol content on its beer products. A-B's claim was for trade secrets misappropriation, arising out of Clark's supposed taking of beer specification sheets and other materials before he left A-B, which arguably were instrumental in the development of the class action suit. Last week, the California court denied Clark's special motion to dismiss, finding that the trade secrets suit was not a SLAPP under California law. The Court determined Clark's protected activity - that is, participating in the class action against A-B - was "merely incidental" to the claims of trade secrets misappropriation and therefore beyond the anti-SLAPP law. Put another way, A-B's claims stood on their own without reference to the class action suit. The court's ruling reflects the narrow set-up of California's anti-SLAPP law. In particular, California law does not specifically cover claims brought "in response to" government petitioning activity. Had such a provision been part of the statutory scheme, the court may have considered a number of other factors bearing upon A-B's claim. Illinois' anti-SLAPP law, for instance, is much broader, in that a responsive or retaliatory claim may fall directly within the statute. Courts in Illinois consider on a case-by-case basis whether the suit is truly relatiatory and will examine "retaliatory intent." However, the court in the A-B case stated that "evidence of [A-B]'s motivation does not establish" that its claims "arose from Defendant's protected activity." The court's decision not to consider subjective intent may be surprising given the nature and purpose of anti-SLAPP laws. As a practical matter, this objective analysis has the effect of requiring courts to assess the nexus, or fit, between the underlying claim and the allegedly retaliatory claim. If the former has an independent factual and legal basis, then it does not "arise from" petitioning activity. The court did not consider a relatively recent amendment to California's anti-SLAPP law, Section 425.17 of the California Code of Civil Procedure. That section, enacted to prevent "a disturbing abuse" of the anti-SLAPP law, meant to exempt certain actions arising from certain commercial statements or conduct. The provision is densely worded and may not have directly fit the A-B/Clark dispute. But, at the very least, it recognizes in the SLAPP context the principle that commercial speech generally has more limited protection under the First Amendment compared with non-commercial interests. In this sense, California seems to be shifting away from allowing anti-SLAPP motions if they do not truly concern a matter of important public interest.